By combining outdoor elements such as ceremonial and abstract floral designs, the Floral Blossom Dining Set by Home Style is brought to life. This set is constructed of cast aluminum in a powder-coated charcoal finish with patterned Weather-resistant burnt sierra leaf polyester cushions. The 48-inch outdoor table and four armchairs features hand-applied antiqued highlighting sealed with a clear coat for protection, attractive patterned design, and 2-inch umbrella hole with black cap, and nylon glides on legs for stability. Elegant design and sturdy construction, this piece is finished off with stainless steel hardware. Assembly required. Set includes 48-inch table and four armchairs with cushions. The Westmount collection is a combination of prestige with a transitional design. The Table allows for more room to entertain your family guests in the outdoors. Full-round woven all-weather synthetic rattan and rustproof welded aluminum frame will make our tables and chairs enjoyable for seasons to come. 5-PIECE SET - This dining table set includes 1 round table, 6 round chairs. This table set has a triple powder coat aluminum frame, wicker rattan body and sunbrella cushions. DIMENSIONS: Table W 60 in.x D 60 in. x H 30 in. (150 LBS), Chairs W 24 in. x D 24 in. x H 34 in. This outdoor dining set is ideal for patios and decks. Designed for stylish outdoor dining & entertaining, it can turn your backyard into that gorgeous extra dining area you always wanted. The combination of teak and stainless steel makes this patio set an absolute highlight. The great look of natural wood and the durable frame are impressive. The VITALE outdoor dining set features a large dining table with a stainless steel frame and a teak slat top. 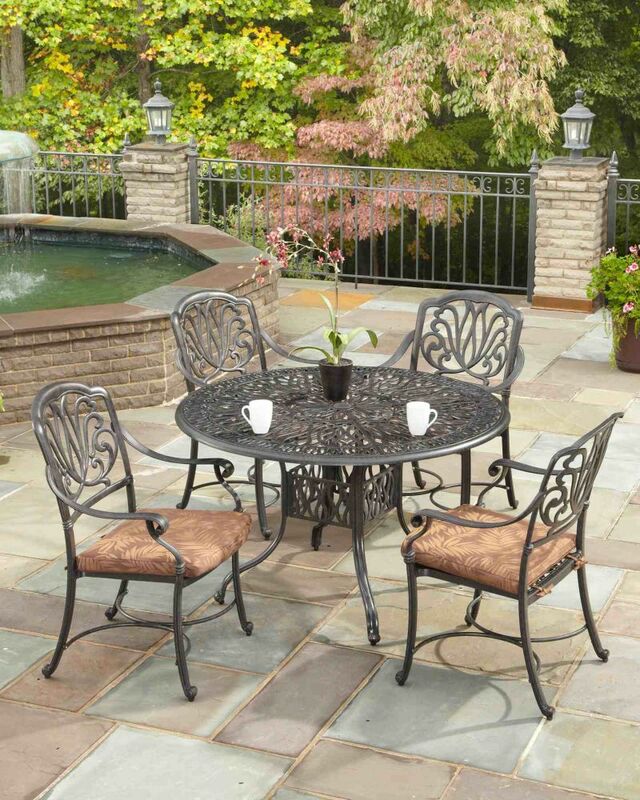 Floral Blossom 5-Piece Patio Dining Set with 48-inch Round Table and Arm Chairs in Charcoal By combining outdoor elements such as ceremonial and abstract floral designs, the Floral Blossom Dining Set by Home Style is brought to life. This set is constructed of cast aluminum in a powder-coated charcoal finish with patterned Weather-resistant burnt sierra leaf polyester cushions. The 48-inch outdoor table and four armchairs features hand-applied antiqued highlighting sealed with a clear coat for protection, attractive patterned design, and 2-inch umbrella hole with black cap, and nylon glides on legs for stability. Elegant design and sturdy construction, this piece is finished off with stainless steel hardware. Assembly required. Set includes 48-inch table and four armchairs with cushions. Floral Blossom 5-Piece Patio Dining Set with 48-inch Round Table and Arm Chairs in Charcoal is rated 2.0 out of 5 by 1. Rated 2 out of 5 by sledge from Looks Nice But........ I got this a month ago so I've had time to cool down. I expected more regarding the product and what HD doesn't want me to mention . Although this set looks good when assembled, it was garbage to assemble. The casting is very poor. All factory holes in the casting had to be enlarged for the chairs to be assembled. The adjustable feet would be suitable for something that never gets moved, the plastic material was coming off the minute the chairs were used on a brick paver patio but hopefully we can buy something that is durable or we'll have to leave off. I does look nice but I don't think it was worth the cost or aggravation.